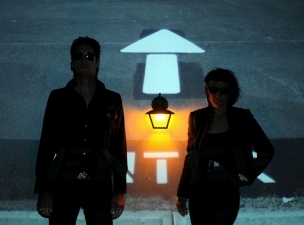 Since forming in 1998, Detroit electropunk pioneers ADULT. have been a restlessly creative duo who've always pushed boundaries between genres, various disciplines, and many forms of media, including photography, painting and film. Comprised of married couple ADAM LEE MILLER and NICOLA KUPERAS, the pair has been largely absent in music over the past few years, working on their other pursuits, including a horror film trilogy that they also scored the soundtrack for. Well, lucky for us, ADULT. are returning in 2013 with a brand new record, The Way Things Fall on Ghostly International, that sees the group reenergized and more self-assured than ever before. Whiplash synths and memorably twisted melodies combine with personal-yet-universal, occasionally surrealist vocals to form a new batch of ADULT. 's mutant pop songs that sound refreshingly new. Also hailing from Detroit, three-piece audio-visual art squad RITUAL HOWLS are meat machines crafting sound and light to fit their particular vision. The group creates melodic, art-damaged noise-rock while projecting found video samples of collisions, scrapings on concrete, pounding metal & oak over their live performance. This is the kind of feral art that leaves claw marks on your soul. ESPECIALLY GOOD – also from Detroit! – is an electro trio who utilize found sounds with software and analog instruments while combining rhythms from many different styles of dance, industrial, house, noise, ambient, and of course, classic Detroit techno. It’s a Detroit freak-fest, boys and girls – our favorite kind of fest!